Shirdi Sai devotee Umaji from India says: I am Uma Vaidyanathan from CBD Belapur, Navi Mumbai Roll no. 14, Blue house. I was introduced to Mahaparayan by my friend Bhuvana. 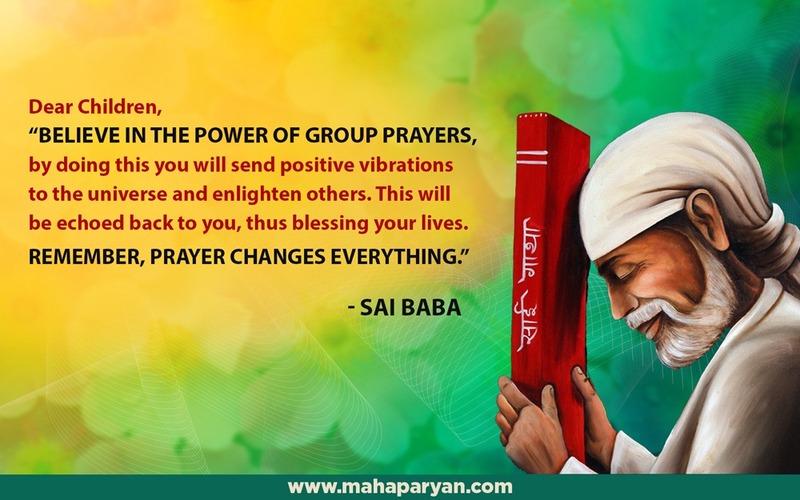 After I started Mahaparayan I have received many blessings. I received "Daughters of Navi Mumbai Award" in the month of April. My son was due for his promotion since last two years and he got it in the month of May. I was working for the last 30 years and since 3 years I have stopped working but last week I got a call from an organisation to join them as Project Director" and I will be starting my work this week. In the month of May I visited Shirdi after my daughter's exam and due to heavy rush could not have a good darshan. This made me very upset and I thought that probably I am lacking in something that is why Baba did not bless me with good darshan. But within few days I got the news that my son got promotion which he was expecting since last two years. I am happy that Baba blessed me and my children. Baba never lets go anyones trivial sewa also unnoticed. He the perpetual Sadguru, ensures everyone’s happiness and His ways are unique and subtle. Love You Sai. Jai Jai Ho Sai.